They existed only in your imagination …. Until now! With over 3 million copies in print, the Fablehaven series by New York Times best-selling author Brandon Mull is one of the most popular middle-grade fantasy series to date. 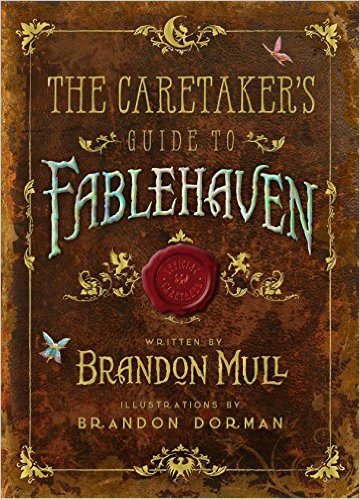 Now, first time ever, The Caretaker’s Guide to Fablehaven provides a visual discovery of the series, and is loaded with insider’s knowledge and hand-scrawled notes. Readers can actually see the mystical creatures from the series like dragons – each one has a name, a special power, and looks distinctly different from the others, but until this book there was no illustrated guide. The book is also a springboard to the Fablehaven sequel series, Dragonwatch (releasing Fall 2016) and features clues to the characters and creatures fans will find in the upcoming books. “I tell my secrets only to people I know I can trust. “Smart people learn from their mistakes. For Fablehaven fans, this is a great addition to the series. It would have been very helpful to have while reading the series, so that at a glance you could figure out what the different creatures are that you are reading about. 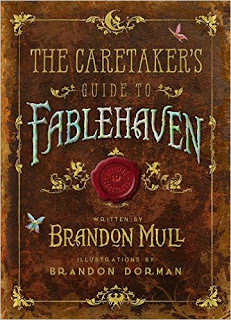 So run, don’t walk, to get your copy of The Caretaker’s Guide to Fablehaven. Don’t leave home without it…..you never know what you will run into (It’s a scary world out there)! Recommendation: Second to third grade and up. My boys read Fablehaven when they were in second grade, so this follows suit. It may be too difficult for a second grader, so third grade may be more appropriate.